Could LAUSD Seriously Be Taken Over For Overspending? A county official showed up last month at the Los Angeles Unified School Board meeting to deliver a stark reality check. "Although LAUSD is a large district," said Candi Clark, CFO of the L.A. County Office of Education, "it is not a district that is too big to fail." Clark's warning: If LAUSD did not stop spending more money each year than it took in, county officials had the power to intervene — and maybe even appoint a "fiscal advisor" with the power to veto school board decisions. On one level, the timing of Clark's Aug. 21 warning is surprising. In previous years, LAUSD has submitted more grim budget projections to the county — and the county's response has been more measured. Now, LAUSD officials believe they will (barely) be able to balance their books in each of the next three years. So Clark returned to the board Tuesday to underscore her warning one more time: "I'm concerned," she said, "that that window of opportunity is closing to address the district's fiscal challenges." FIRST, THE BASICS: WHAT HAPPENS TO A SCHOOL DISTRICT HAVING MONEY TROUBLES? California law requires school districts to update their budgets annually. But districts are also required to submit a spending plan that covers the next three years — and a forecast of whether they'll have money left over at the end. If a district projects a deficit in any of the next three years, state law requires county-level education officials step in. Sometimes, the extent of the county's intervention is to suggest a few edits to the budget. In the most dire emergencies, the state will take over the district — as it did with Compton Unified in 1993 or Inglewood Unified in 2012. In districts that fall into "receivership," the state strips the school board and superintendent of all authority and appoints an overseer with broad powers to restructure the district's finances. EXACTLY HOW DIRE IS L.A. UNIFIED'S BUDGET SITUATION? UTLA leaders argue LAUSD has amassed a huge reserve — now estimated at more than $1.8 billion — all despite district officials' warnings year after year that fiscal calamity was not far away. The district "has a history of using [those projections] to justify draconian cuts and neglect on our campuses and in our classrooms," UTLA vice president Cecily Myaert-Cruz said Tuesday, "However, the sky never falls." But LAUSD leaders already plan to spend almost that entire reserve. If they didn't spend that money, they say the district would quickly fall into the red; at its current pace of spending, LAUSD will expend around half-a-billion dollars more each year than it will take in. 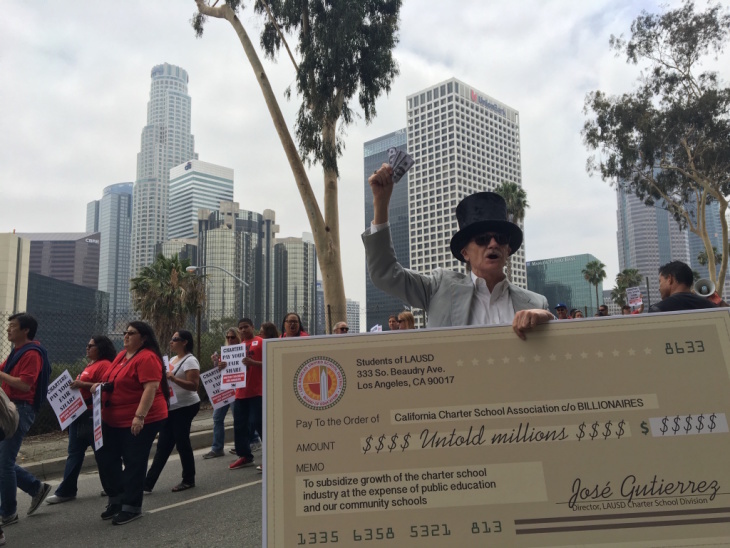 LAUSD did set aside some of its reserves to pay for some of the items UTLA wants to negotiate into its new contract, like raises for teachers, smaller class sizes, and more nurses, deans and counselors — but that's precisely what seems to have Clark and L.A. County officials worried. "It's very clear you're living off the reserves," Clark told board members on Tuesday. "That's not wise, that's not prudence, that's not fiscal solvency." BOTTOM LINE: HOW LIKELY IS THE COUNTY OR THE STATE TO INTERVENE IN L.A. UNIFIED? Indeed, a county or state intervention would be a rare exercise of power. At Tuesday's board meeting, UTLA leaders dismissed the insolvency talk as an attempt by the district to put public pressure on the union. After all, Clark's original warning in August came during a meeting she attended at the invitation of new LAUSD Superintendent Austin Beutner, who is locked in tough negotiations with the union. Those negotiations concern county officials, who have sent up red flags about the contract talks with UTLA. Their concern? The district might pay for concessions to the union out of its dwindling reserves. In a letter sent Monday to the district, Clark wrote "any salary and benefit increase, if paid from reserves or other one-time resources, could adversely affect the fiscal condition of the district. We caution the district that this approach of funding ongoing salary increases with one-time resources is not a best business practice." "[Clark] is doing her job and she's doing it well, actually," said Michael Fine, who runs the state's Fiscal Crisis and Management Assistance Team, which assists financially-troubled school districts. In an interview, Fine said he believes Clark's warning is meant to be taken seriously: "Do I think, in any way, it's meant to be a scare tactic? No." And here's the bottom line: Even if the district made no concessions to the union in its contract negotiation, it would still face huge, structural threats to its budget. Student enrollment is declining — and when enrollment declines, state funding declines. The district is not setting aside enough money to pay for retiree benefits. Health care and pension costs will soon consume half of the district's annual budget. Said board member Nick Melvoin said in a recent interview: "If the only way to fix that — because we have an unreasonable teachers union who is not putting the interests of kids, families and teachers first — is to go into state receivership and force a restructuring, then that has to be on the table, because we're not playing around." The key concern is that the district has said it will reduce expenditures by close to $73 million in 2019-20 and $73 million in 2020-21 but has not identified where the reductions will be made. Clark went on to say that LAUSD's board must pass a more specific plan to cut expenses in the next two years. Until they do, county officials will count those undefined cuts as deficits. That means, as far as the county's concerned, LAUSD's projection that the district will just eke out a surplus in 2020-21 is incorrect; the county thinks LAUSD will end 2020-21 with a deficit of more than $67 million.